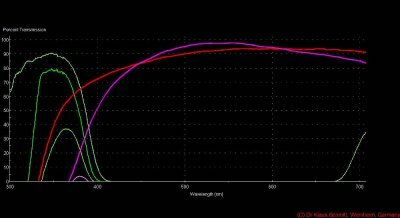 Some priciple thoughts, why normal lenses and filters do not work for reflected ultraviolet (UV) photography. I get quite a few questions, why a certain camera, lens, filter setup does not or not satisfyingly work for UV photography. I will try and show the effects of that optical system using some transmission graphs I recently made. So here some results using one my X-lenses (red line) and a very modern, multicoated lens (purple line), a Baader 2" U-filter (dark green line) and a common UV transmissive filter (very light green line) such as a Schott UG-1, Hoya U-340, B+W 403, Kodak Wratten 18A, Nikon FF etc. sometimes also called "Woods Glass". Let's look at the filters first. The older, common UV filter has a benefit, quite a high peak UV transmission of about 90% - but it also shows IR transmission from about 670nm onwards. In former times of film based cameras, that was no issue, since these film had no IR sensitivity. Today in the times of digital cameras, and especially the modified ones, their IR sensitivity is quite resp. very high. So that leads to quite some contamination of that supposedly UV image due to "IR leakage". One cure would be to add ("stack") another filter in front which passes UV but blocks or reduces IR. Such a filter would be the Schott blue-green BG-38 or BG-40 filter. But that does not completely cure that problem. The german astronomy company Baader developed because of that fact their Baader-U filter (also called "Venus" Filter, since astronomers use it to make details of the surface of planet Venus visible), with perfectly suppressed IR, as the dark green line nicely proves. This fact made it my "filter workhorse" for reflected UV photography, even if the peak transmission is a bit lower at about 80%. Now about the lenses. Usually a photographic lens should reproduce visible images, which is the wavelength band of about 400-700nm. This is why lens makers apply a special multicoating (aside from achieving higher light transmission), which usually blocks light outside this visible waveband. The purple line of a recent multicoated lens proves, how succesful this is done today. For UV photography, however, the UV-A band (300 - 400nm) is the interesting one. So using a modern lens and that Baader U-filter leads to that mini UV transmission of about 5% only, which usually causes very long exposure times, grainy images and a lot of frustration for some who wanted to step into that field. Here the wrong lens is the reason for that, not the filter! One solution would be to get one of the highly specialized $$$$ quartz / fluorite lenses I have reported about here, but this is just for a few who can afford that or have access to one of these lenses - surely a pleasure to use. But the ambitioned amateur or researcher on a tight budget needs a solution too. This was the reason why I started some reasearch to find lenses which would allow similar image quality, but at affordable cost. So my series of X-lenses was born, the most prominent being the X135 (f=135mm), X50 (f=50mm) and X35 (f=35mm), one of them shown as bright red line which shows quite some more and deeper into the UV reaching transmission, one of them to about 310nm. The system lens + filter using an X-lens now leads to a much higher UV output to the camera chip (assuming a modern digital SLR camera, which also has to have some UV sensitivity, such as a Nikon D70(s), D40 or modified D200) of about 7 times more, a gain of 3 stops or 3EV in photog speak (this is just about 1 stop less than using the UV Nikkor!). This allows much shorter exposure times, better quality in terms of graininess (noise) and UV reproduction, since also a broader UV waveband is covered. Just a remark, the high UV transmission is a must for a suitable UV lens, but also good sharpness, high contrast, flare resistance, no hot-spots, etc. are requirements such an X-lens has to meet, and I have not jet mentioned an important point - focus shift. This latter point was solved by calibrating such a lens for UV use, to allow for a sharp visible and UV focus. The explanation is not yet complete, two important parts of the system are not covered here in detail, the camera and the light source(s), which should be used for UV photography. I will elaborate on that at a later time here.